In February 2017, Gerald Wallace, 35, called the Islamic Center of Greater Miami and left a message with threatening and racist language. He made statements such as “I hate you Muslims, you Muslims are terrible. I hate you people. I’m gonna go down to your center, I’m gonna shoot all ya’ll,” the Miami Herald reported. Following the phone call, Wallace told the police he felt “absolute hatred” toward Muslims following the 9/11 terrorist attacks. Due to his behavior, Wallace was charged with committing a hate crime. He pleaded guilty and will be sentenced in January. He faces up to 20 years in prison and a $250,000 fine. This means any type of offense can be a hate crime if it targets someone for one of these factors, including assault and battery, homicide, sexual assault, robbery, burglary, and more. 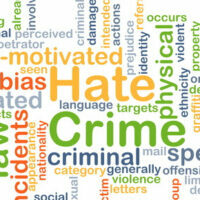 If the offense you are charged with is defined as a hate crime, then you will face a higher charge. For instance, a second-degree misdemeanor becomes a first-degree misdemeanor. A first-degree misdemeanor becomes a third-degree felony, and so on. If you are charged with a first-degree felony, it can become a life felony. In addition to facing criminal charges for a crime that targets a protected class, you can also face a civil lawsuit from the victims, according to section 775.085(2). If the individual or organizational victim establishes that they have been coerced, intimidated, or threatened by clear and convincing evidence, then they may pursue treble damages and reasonable attorney fees and costs. Treble damages means that after the victim proves their compensatory damages, including damage to their property, physical injuries, medical costs, and pain and suffering, the court can award three times that amount. You can ultimately be charged a great deal of money for committing a hate crime. There are numerous federal laws that make hate crimes illegal and punish them harshly. The most recent federal hate crime law is The Matthew Shepard and James Byrd Jr. Hate Crimes Prevention Act of 2009, 18 U.S.C. § 249. It is a historic act because it extended the coverage of federal law to victims who were attacked due to their actual or perceived sexual orientation or gender identity. Federal law also protects individuals based on their actual or perceived race, color, religion, and natural origin. If you have been charged with a hate crime in Kissimmee, contact our experienced criminal defense lawyers of Salazar & Kelly Law Group, P.A. at 407-483-0500. We will review the charges against you, including the higher offense due to the element of prejudice, and explain your rights and options.